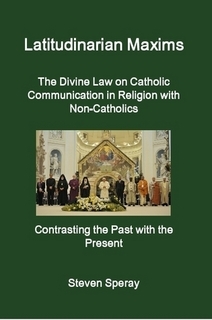 The scope of this study examines the accuracy and truthfulness of this statement given by Paul VI and the CDF based on numerous teachings and practices of the Catholic Church prior to the council. This study focuses on the Divine law particularly and will be divided into two parts beginning with forgotten principles spelled out in writing taken by Bishop George Hay (1729-1811). Also provided are numerous traditional teachings of the Church then contrasting them with the Vatican II popes.